Curzon Street Station will become the biggest building in central Birmingham, with a shimmering glass facade stretching a quarter of a mile. The station, which will take nearly a decade to complete and will see more than five million tons of earth moved, is set to be operational by 2026. The proposals, set out in the Curzon Street Masterplan, show it will stretch from Millennium Point to the existing Moor Street station opposite the Bullring Shopping Centre. The lower eastern entrance will be at ground level from New Canal Street and Curzon Street while the upper concourse western entrance will join Moor Street Queensway, with a connection to Moor Street station. HS2 chairman David Higgins said it offered a major opportunity to stimulate investment and was excited about the city council’s plans. He said: “We welcome the launch of the Curzon Street Masterplan which shows an exciting vision of how the area around the station can be developed and transformed. This is exactly the kind of ambitious plan that will stimulate the public, private sector partnerships needed to unlock investment. The structure of the Curzon Street station will take about five years to complete, starting in 2018. It will take another year to fit it out from 2023 and undergo testing and commissioning until 2026. The station will have seven platforms, six for domestic train services with the seventh capable for international services to European cities. Trains coming into Curzon Street will arrive along a viaduct over the Digbeth Branch Canal. Rail journey times will be reduced to London, Sheffield and Manchester. 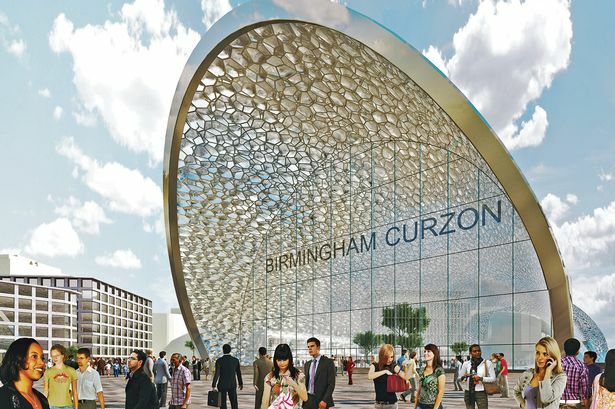 Birmingham City Council leader Sir Albert Bore said the masterplan showed how the authority would transform the area around the station, which will be paid for by HS2. The council is now seeking funding for the vision which would give Birmingham a station quarter comparable to those in major cities throughout the world, said Sir Albert. “We are trying to create a station that would be seen alongside others in the world as an example of what a modern station should look like,” he said. He added that the station represented a major investment opportunity even before it is operational. He said: “There is potential to bring about significant investment in advance of the high-speed line operating and that is how HS2 are seeing things – the stations can be catalyst for investment.